The global quartz market is expected to grow at a CAGR of over 5% during the forecast period of 2019 - 2024. The major factors driving the market studied are demand for quartz sand in the petroleum industry and the demand for high-purity quartz in the semiconductor industry. However, labor-intensive industrial structure is likely to hinder the growth of the market studied. Electronics and semiconductor industry is expected to dominate the global market during the forecast period. Emerging technologies in the development of quartz crystal is likely to act as opportunity for the future. There has been an increasing demand for quartz from the electronics industry. This is majorly because of its increasing usage in devices, such as mobile phones, tablets, laptops, and desktops. 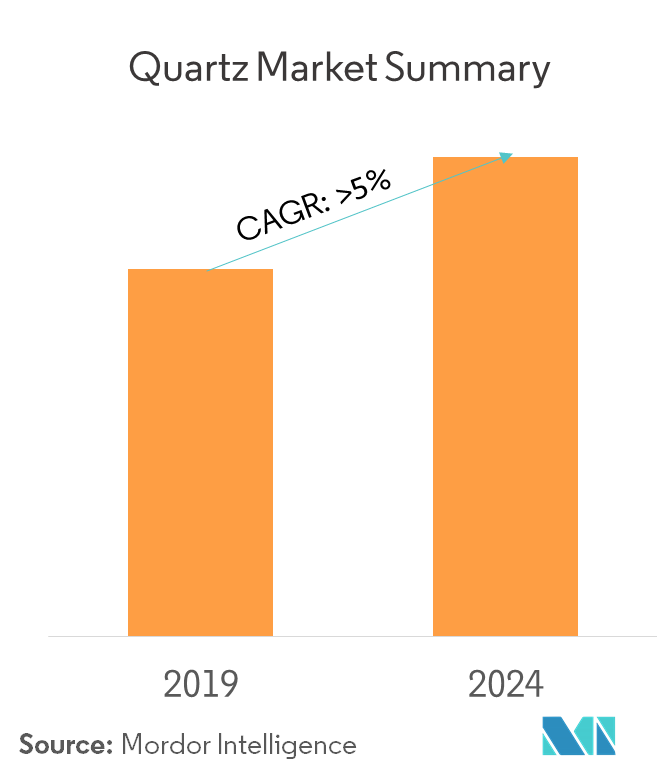 With the increase in production and usage of LCD/LED TVs and other electronic devices in the developing countries, including China, India, Thailand, and Vietnam, the demand for quartz has witnessed an increase from the electronics industry. 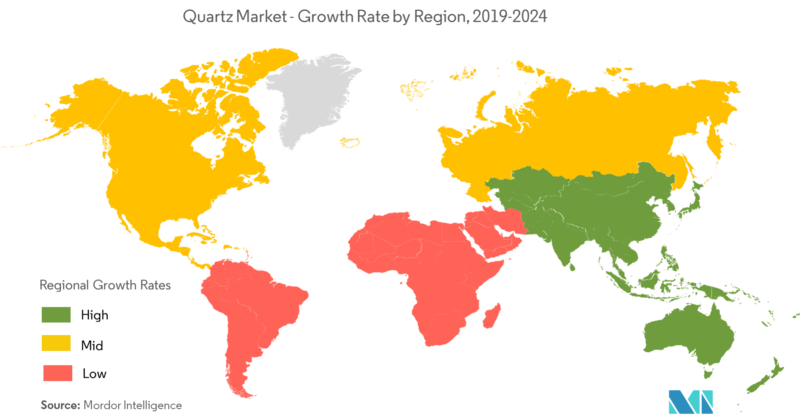 Moreover, the governments in the developing countries are investing heavily in their electronics industry, which is expected to further boost the demand for quartz. China is embracing cutting-edge display technologies, with an aim to become the largest supplier of display panels in the coming years. For instance, in India, the Karnataka government has collaborated with Indian Electronics and Semiconductor Association, in order to make India a design-led electronics hub. Owing to such factors, the demand for quartz is likely to witness rapid growth from the electronics industry. China is expected to dominate the quartz market in Asia-Pacific and is also likely to witness the fastest growing demand. 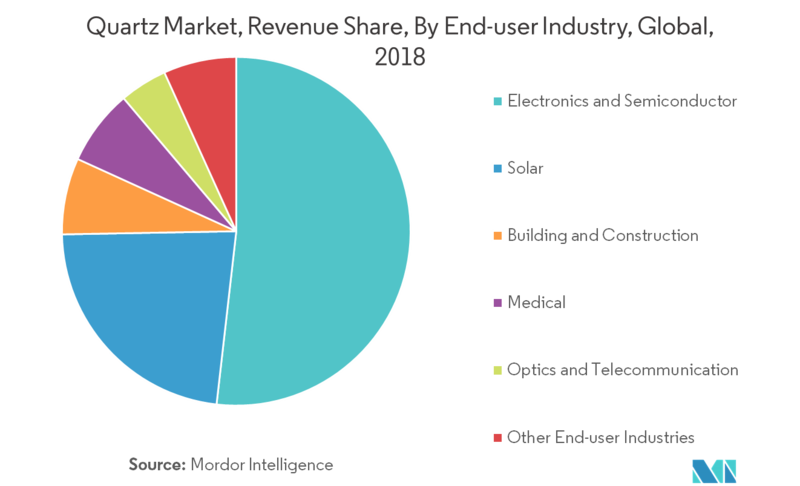 This is majorly owing to the increasing demand from the end-user industries, including electronics, building and construction, and the medical sector. In China, the housing authorities of Hong Kong have launched various measures to push-start the construction of low-cost housing. Initiatives, such as “Made in China 2025”, are expected to improve industry efficiency, product quality, and brand reputation, which are expected to spur the development of domestic medical device manufacturers and increase competitiveness. Such factors are expected to increase the demand for quartz during the forecast period. 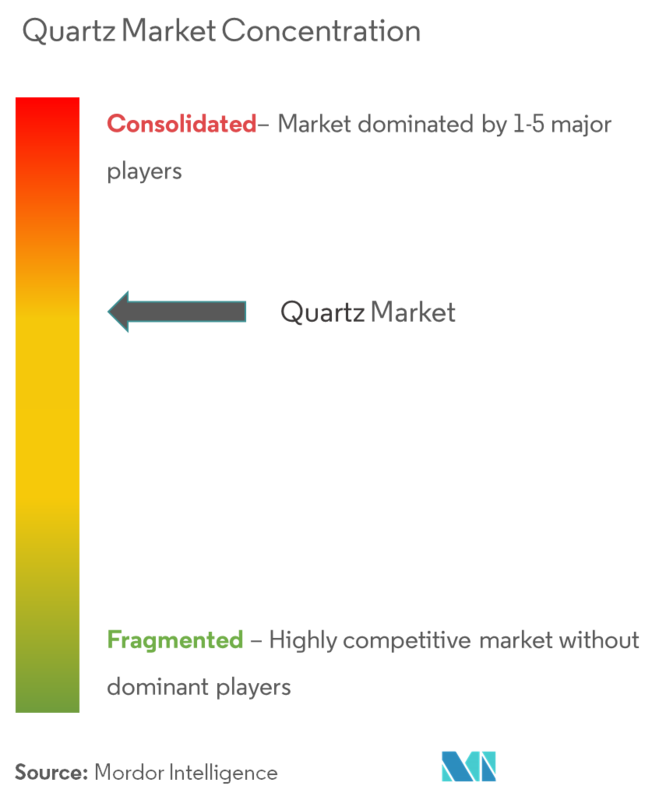 The global quartz market is partially consolidated. The major players of the market studied include, The QUARTZ Corp, Jiangsu Pacific Quartz Co., Ltd., High Purity Quartz Pty Ltd, and Sibelco amongst others.